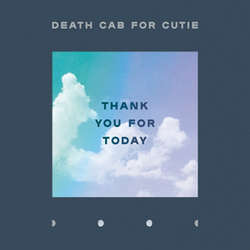 “Thank You For Today” is the sound of Death Cab For Cutie both expanding and refining; a band 20 years into its evolution, still uncovering new curves in its signatures, new sonic corners to explore. The Seattle, WA, band’s ninth studio album, recorded in Los Angeles with producer Rich Costey in late-2017 and early-2018, stands alongside classic Death Cab For Cutie albums including their 1998 debut, “Something About Airplanes,” and 2003’s masterful “Transatlanticism,” as a definitive collection – 10 tracks that are by turns beautiful and dynamic and darkly anthemic and bittersweet. “Thank You For Today” was produced and mixed by Rich Costey (Fiona Apple, Franz Ferdinand, Muse), who also produced the band’s last album, the Grammy nominated “Kintsugi.” LP includes a download code.